Unless noted otherwise, this is the starting position for the next series of exercises. Stand up with your lumbar spine against the Swiss ball, holding your feet slightly apart for stability and a few inches to the front of your hips. If you're not properly balanced you risk getting your body slammed against the wall. Hold a smaller ball low, in front of you. Here we have chosen a light plastic ball but, as you advance, a heavier ball can be utilized. 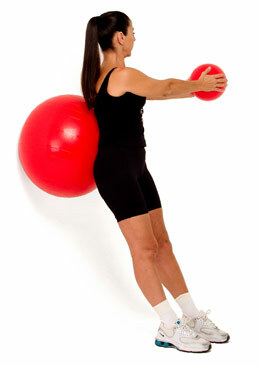 Proceed to raise the ball forward, to shoulder level. Proceed to rotate your trunk (not your arms) to the side. Slowly begin to get a feel for the exercise. 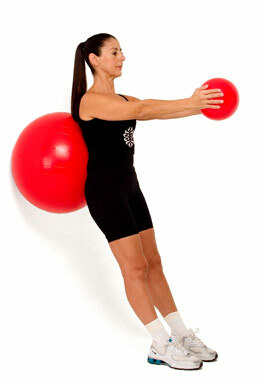 The Swiss ball will rotate some as you move; controlling that rotation is part of what makes this routine so effective for the core muscles. Repeat 10-20 times each side.